There’s just something about Spring that makes me giddy. I’m not sure if it’s the colors or the idea of warm weather, but I know I just can’t wait! In celebration of Spring I’ve put together a decadent collection of Spring Desserts perfect for Easter, that are pleasing to the eye as well as the tummy. Jenny, thank you so much for including my chick cupcakes! They are absolutely adorable Hollie. Thank you for joining in on Whimsy Wednesdays. What a great roundup! Thanks so much for including my Carrot Cake Muddy Buddies! Loved your muddy buddies! Thanks for joining in on Whimsy Wednesdays. Thanks for pinning and joining in on Whimsy Wednesdays! Wow! Thanks for the double feature!! It’s such an honor to be amongst the list of features. 🙂 Have a wonderful week! Your marshmallow carrots and spring pots were too cute, not to feature both. Thanks so much for sharing at Whimsy Wednesdays! What an amazing line up of Easter treats – wow!!! Pinning to my Easter board. Thanks so much for including my Bunny Cookie Bark! Thanks so much for pinning Leigh Anne. I loved the colors of your Bunny Cookie Bark. Now if it would just get warm enough here in NY so that we can start to see those colors. Thank you so much for sharing my Peeps cups! 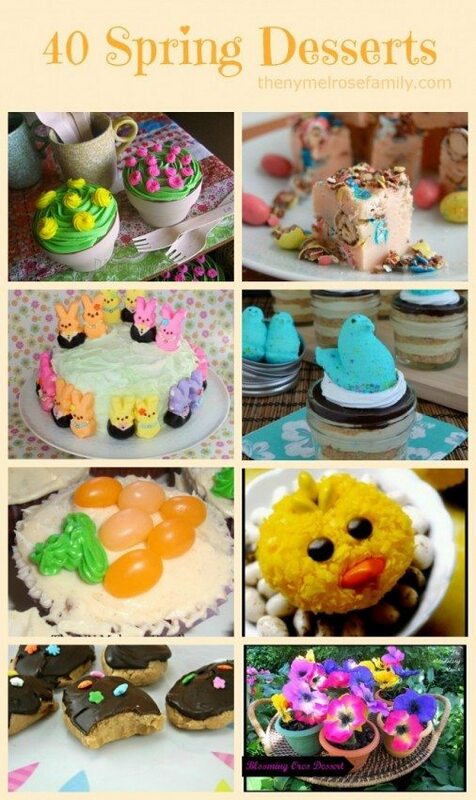 So many fun Easter treats in this round up! I love those cute little Easter chick cupcakes! Thanks so much for joining in at Whimsy Wednesdays Jocelyn. I love anything with peeps, but especially yours because of the cute cups. What an amazing bunch of recipes! So many to choose from, but I think I’m going with the Strawberry yogurt and Jello yogurt bites. I have a grandson who has food allergies and we have to be very careful what we serve. He is only 5 so I don’t want to tempt him at Easter…we will all eat his ‘kind of food’ this holiday dinner. Those two desserts are perfect and look delightful too! Thanks for sharing. Those were two of my favorites as well Debbie because they were so fresh and healthy. Thank you so much for including my Strawberry Yogurt Dessert! Great list of recipes. Yum! Pinned this! Thanks so much for pinning Donna and for sharing at Whimsy Wednesdays! thank you SO much for including my cookies in your roundup! I am seriously drooling over that Easter Egg Fudge! Amazing! Love the roundup. Thanks so much for including my Chocolate Babka. I enjoyed making it and eating it too.